Fans of The CW network's line-up will be very familiar with actor cousins Stephen and Robbie Amell. Stephen has had continuing success as the title character on DC comic hero series Arrow, headlining his own show while crossing over to shared-universe series The Flash and Legends of Tomorrow. While Robbie only got one year out of sci-fi series The Tomorrow People, he found new life (three lives and counting, actually) as one half of combustible superhero Firestorm on The Flash. Robbie also appeared on this year's revival of The X-Files, while Stephen will soon be seen on the big screen in Teenage Mutant Ninja Turtles: Out of the Shadows. In the midst of both their busy schedules, the two have been putting a new film together. As Robbie explained at a recent fan festival, the cousins had long hoped to work on a joint project, inspired in part by their collaboration on The Flash/Arrow crossover episodes. Now Amell has released a trailer for Code 8 on Facebook, which you can watch above. The accompanying post text reads: "I've been working on something. So has Robbie Amell & Sung Kang." On the film's FB page, Robbie and Sung (from The Fast and the Furious franchise) are listed as actors along with Aaron Abrams (Hannibal), Chad Donella (Taken 3), and Alfred Rubin Thompson (Sons of Anarchy). Jeff Chan directs from a script by Chris Pare, and both will produce alongside the Amells, Geoff Mclean, and Tommy Dingwall. The teaser trailer reveals a sci-fi concept, where "4% of people possess abnormal abilities" but "make up 60% of all arrests." 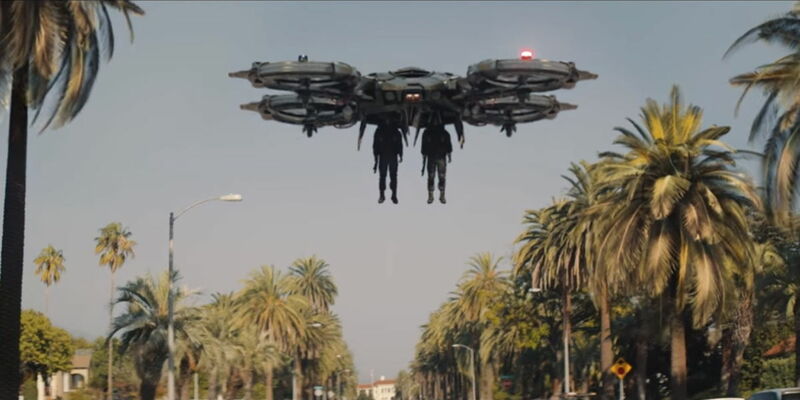 Robbie Amell looks to be one of those about to be arrested in the above clip, where an approaching police car is backed up by a hovering aircraft that drops two android officers to the street. The official plot hasn't been released, but the Code 8 Twitter account promises that will change on March 22, when an extended trailer will also likely be released. There's a handy countdown to that date on Code 8's official website, where interested viewers can sign up to receive "exclusive" updates. While the teaser video doesn't reveal much, it's already achieved an intriguing, ominous vibe that hints at an overactive police force unfairly arresting harmless people with enhanced skills. Robbie Amell may have been inspired by more than just working with Stephen while at The CW, since his series The Tomorrow People was also about those who had evolved with superior abilities like telepathy and teleportation. It's too early to tell exactly how successful this new Amells collaboration might be, but it already looks pretty impressive for a project cooked up in the last six months or so by "friends and family." Screen Rant will keep you up to date with Code 8 news as it becomes available.